This Lent, Campus Ministry stands with refugees and immigrants around the world. 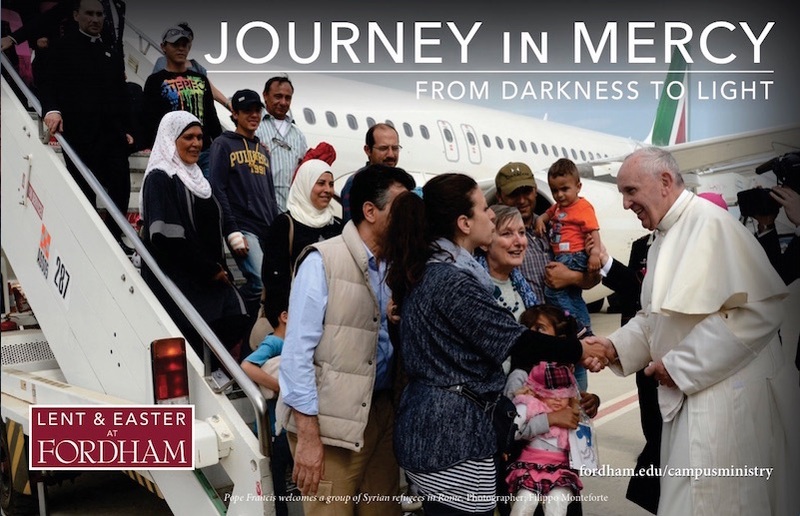 During this Lenten season, Campus Ministry has worked to highlight plights of refugees, immigrants, and internationally displaced peoples. Our Refugee Simulation Experience encouraged students to walk a mile in the shoes of a refugee. 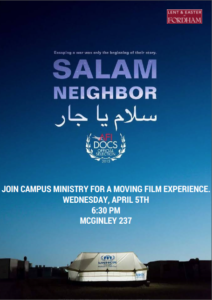 As a follow-up, we will be hosting a screening of the film Salam Neighbor. The film follows the daily lives of refugees on the Syrian border. All are invited to this moving film experience. This weekend, Campus Ministry sponsored a service project with Habitat for Humanity. 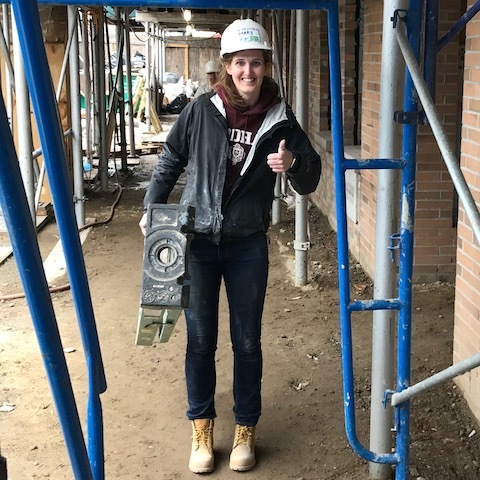 This past weekend, a group of Fordham students participated in the Habitat for Humanity Build for Unity in Brooklyn, NY sponsored by the Pedro Arrupe Faith and Service Community. 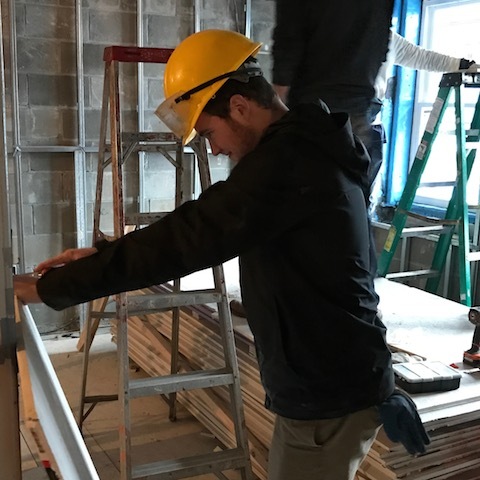 Despite rainy conditions, the students worked on Dean Street condominiums that will later be occupied by local families. 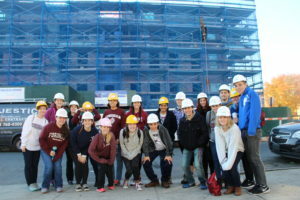 This service project was the second of two annual Habitat builds that Fordham Campus Ministry and Pedro Arrupe sponsor each year. Project participants are invited to reflect on their experience during the season of Lent, as we seek to strengthen our relationship with God through service. Throughout the season, Campus Ministry has hosted a variety of programs that highlight the importance of service and the dignity of all of God’s people. Join Campus Ministry and Habitat for Humanity for the 1st Annual Interfaith Build for Unity! 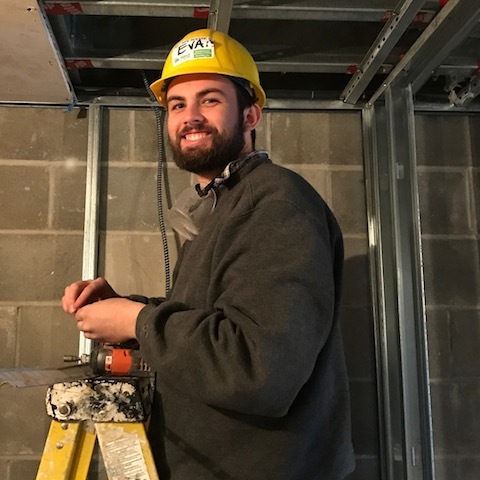 Join Fordham University Campus Ministry and Habitat for Humanity in Build for Unity, an interfaith and community collaboration on the Dean Street Project! Build for Unity brings together people of all colors, creeds and communities to counter intolerance and fund and build homes for local families in need. In the midst of our current national divisions and increased faith-related violence, Habitat feels it’s time to bring diverse and rich traditions together to make a statement about our shared values in New York City: diversity, inclusion and community. Since this initiative launched in Sacramento, California, last year, communities across the country have come together to sponsor and build their own Build for Unity homes. Fordham has sent over 700 volunteers to work with Habitat in the Rockaways and Yonkers in the past four years and there is a high demand for all spots so if you are unable to attend, please cancel as soon as possible to allow others to attend in your place. Time: 8:00 am Ram Vans will depart from McGinley Center ROSE HILL Campus – 5:30 pm Return to ROSE HILL. If you live in Brooklyn, you can meet us onsite, please email cm@fordham.edu to arrange. The season of Lent is a time of preparation for Easter, the great feast of the Resurrection of our Lord Jesus. It is a new beginning and our way out of the shadows of despair, disease and death. The path from darkness to light calls for our conversion, our return to God whose Name is Mercy, with all our hearts. The journey invites us to participate in all three practices the Church offers for our growth in holiness: prayer, fasting, and almsgiving. Join us in this penitential and joyful celebration of Lent and Easter! See the Liturgy Schedule here and our Lenten Programming here! Ash Wednesday signifies the beginning of the Lenten season in the Catholic Church. Below are the Mass Schedules for both the Lincoln Center and Rose Hill campuses. You can also view this schedule on our Liturgy page, or check out our Lent 2017 page for more information on our programs! 8:30 a.m., 12:05 p.m., 5:15 p.m., and 8 p.m.
8:30 a.m. and 12:15 p.m.
3 p.m. and 5 p.m.
We invite you to join Campus Ministry at Rose Hill or Lincoln Center for an interactive refugee simulation allowing ​members of our community​ to walk through the experience at their own pace. 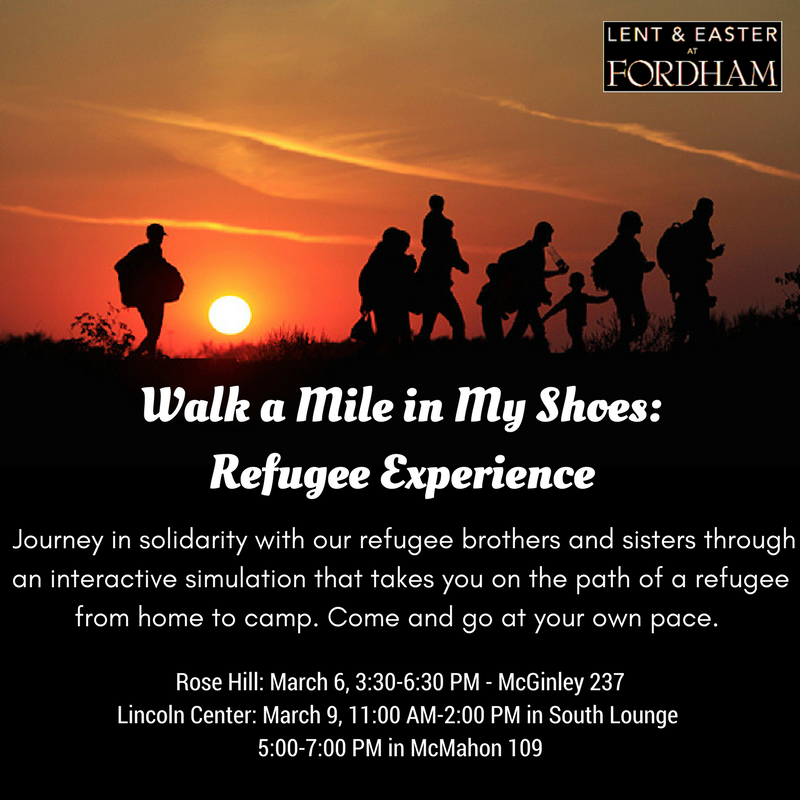 We will have multimedia educational resources spread throughout the space, and students will “walk a mile” in refugees’ shoes on a simulated migrant journey. If you have any questions​ or want to discuss sponsorship, promotion, or participation​, contact Gil Severiano at severiano@fordham.edu. has $5.40 to budget a day for food. 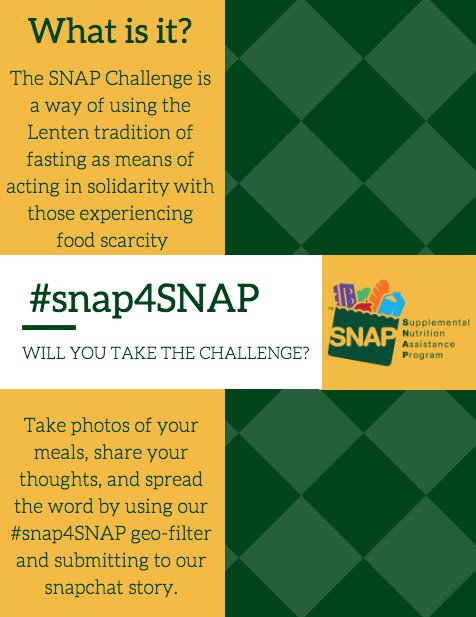 On days such as Ash Wednesday, when fasting is part of​ the​ liturgical observance, we think encouraging students to ​spend no more than​ $5.40​, or use 1 meal swipe,​ is a great way to raise awareness about poverty and food justice. Beginning on ​Thursday, February​ 23​, we will begin tabling in McGinley every weekday until Ash Wednesday to educate students about this issue and encourage them to take the pledge to ​F​ast in ​S​olidarity. The pledge will be written on a banner, which will be hung for people to take photos and post on social media (#snapforSNAP). ​If you or any members of your club are interested in helping us to ​promote this event, or join us while tabling​, please let us know. ​A follow-up​ event will be offered on Wednesday, March 22. 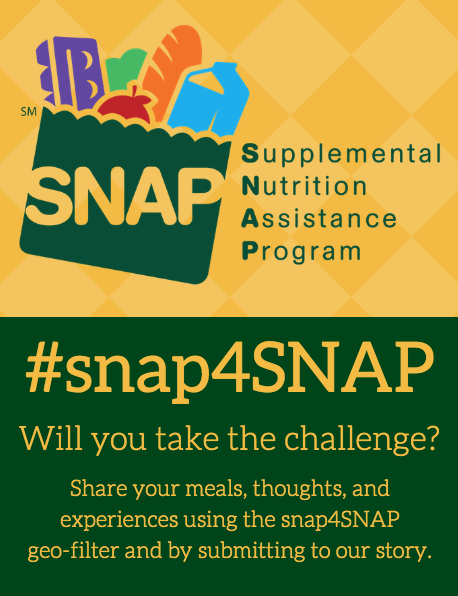 We are seeking volunteers to prepare sandwiches for POTS (local food pantry and community dining room) to distribute, and will end the program with soup and reflection.